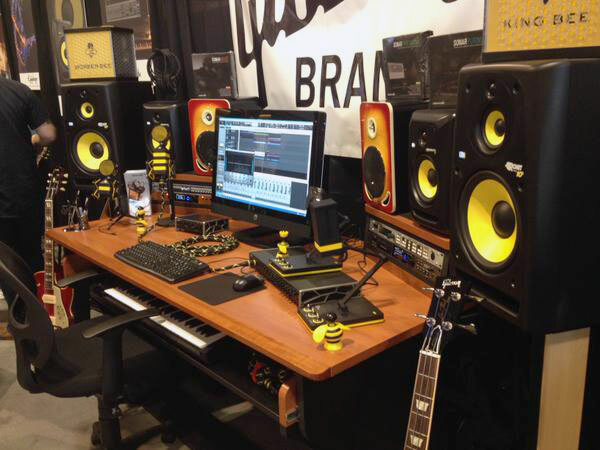 New guitars, recording and DJ software, microphones, monitors and more share booth 825 in Nashville’s Music City Center. 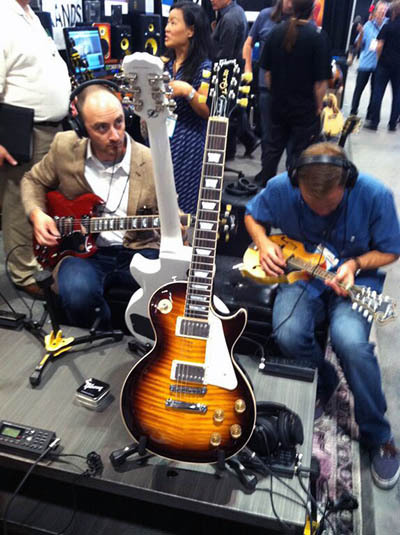 Gibson Brands’ booth 825 at this year’s Summer NAMM in Nashville’s Music City Center is prime real estate, smack in the middle of the showroom floor. And it’s jammed with new products including guitars from Gibson’s USA, Memphis, Custom and Acoustic instrument divisions, Epiphone, Stanton, Cerwin-Vega and Gibson Pro Audio. These show ponies include a host of new solidbody and semi-hollow electrics, previews of three 2016 acoustic models, King Bee Microphones and cables, Les Paul Studio Monitors, recording software from Sonar, Stanton’s Deckadance 2 DJ software and powerful new 10-inch PA speakers. • Electric Guitars and Basses: New limited run guitars from the Gibson Custom Shop and Gibson Memphis are gleaming under the showroom lights. These include the CS7 1957 Style Les Paul Standard Gold Top and the CS8 1950s Style Les Paul Standard, two new Custom Shop models that are inspired by historic instruments, but are packed with modern refinements and appointments for maximum playabilty and tone. The four-sting star of the booth is the limited run Gibson Memphis ES Les Paul Bass With Figured Top, which comes strung with flatwounds and sports Memphis Historic Spec pickups – for great vintage tones — plus Hipshot tuners. Epiphone is also represented with another looker: the limited edition Tommy Thayer "White Lightning" Signature Les Paul, which is resplendent in its white with metallic flake finish, chrome pick guard and twin Seymour Duncan humbuckers. And Gibson USA is displaying the P-90 powered Midtown Standard – which blends solidbody and archtop characteristics — and the ultra-affordable Les Paul CM, which packs Les Paul looks and authority into a trim design with a single ’61 Zebra humbucker in the bridge position. • Acoustic Guitars: Gibson’s acoustic guitar builders in Bozeman, Montana are represented by three 2016 models that update fabled guitars: the J-15, J-35 and J-45 slope-shouldered workhorse models. While the J-15 is a relatively new guitar that debuted in 2014, winning huzzahs from critics and players, the J-35 and J-45 debuted in 1936 and 1942, respectively, and have truly earned their place in history with new chapters to come. • Recording Monitors, Microphones, Cables and Software: Gibson Pro Audio’s (GPA) work desk display is packed. But the newbies include Neat Microphones' King Bee line of two USB and two condenser microphones, which bear a distinctive yellow-and-black-stripe look. They are made to provide high-end sound for low dollars and are perfect for price-conscious, entry-level engineers, podcasters and content creators, and have — pun intended — generated a huge buzz. There’s also a new line of high-quality cloth-enclosed pro audio cables being unveiled. The GPA desk is outfitted with another popular new product: Les Paul Studio Monitors. Plus the latest version of Sonar’s Music Creator recording software. As with Sonar’s other popular recording and editing software products, like Cakewalk, a constant stream of updates and plug-ins are available via a small monthly subscription. • DJ software: With the acquisition of the Deckadance software line, Gibson Brands’ Stanton has become a leader in live DJ software, and the new Deckadance 2 package on display at NAMM offers the latest technology for scratching, beat matching and other aspects of the post-modern turntabulist’s art. More refinements are on the way, but are under wraps for now. • PA Speakers: Cerwin-Vega has found yet another way to pack incredible punch into a Mighty Mouse-sized speaker. The new powered P1000X speakers at Summer NAMM are slammin’, with a power rating of 1000-watts, a 10-inch woofer and high frequency compression driver. They’re killer and fit in essentially any venue space.